So yeah, it's supposed to be me, Sophie, posting today but the thing is...I have a manuscript I promised to turn in over the weekend and so I'm running a little late. I'm going to post on Friday instead, and I hope to have something cogent and compelling to say by then. 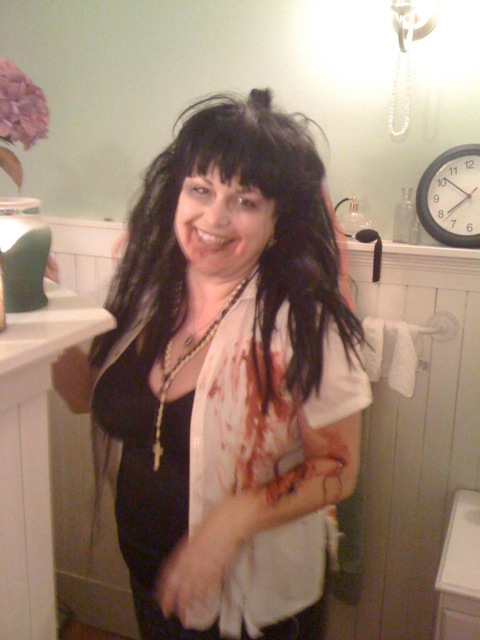 Meanwhile, I thought you all might enjoy these photos from Juliet's annual Halloween bash! Several of the Pens were able to attend - those who weren't working a double shift, or squiring children and nieces around, or not feeling well - and some PensFriends of the highest order. The theme was "Zombie Schoolgirls Gone Wild" and I'm kicking myself for not getting some shots of the house. Next year for sure! Juliet and her housemate Jace must have an underground cavern where they store all the boxes of decorations, including several lifesize corpses, some of whom talk and crawl and do all manner of creepy things. An entire room was given over to costumes for the guests to try on. Tons of food, though as usual I ended the evening with a pile of potato chips in front of me. And lots of fabulous people, because Pens consort with only the most interesting folks around! Awesome right? Get this - she *made* that, all with stuff you probably have lying around the house. I'm not going to give away trade secrets, but one of the more interesting supplies needed to make realistic-looking scars and scabs is *coffee grounds*. 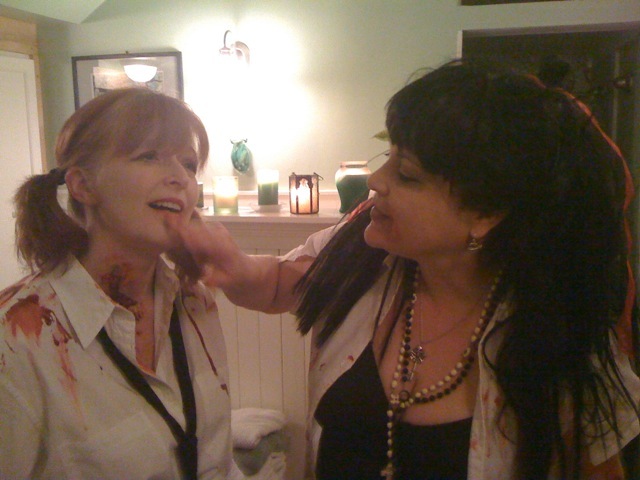 Adrienne was there, and she fell victim to the zombie tide. 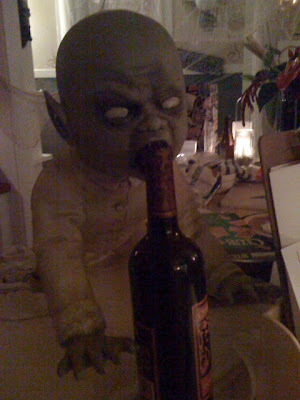 Perhaps the most disturbing image from the whole evening is this little guy, a zombie baby who makes appearances each year at the party. Reminds me of that one scene in THE FOREST OF HANDS AND TEETH. That was a little over the top, right? Well, I apologize; sadly, I appear to have passed the scary on to one of my two children. Uh, can you guess which Littlefield offspring made her pumpkin look like a cute happy lion - and which created Hellraiser, squash version? Happy Halloween to all our friends and readers! As a Pen who didn't make it...thanks for the pics!! Wow. That looks like it was amazing. I spent the evening carving jack-o-lanterns with The Leezlet -- the best part was when she kept gagging from the smell of the pumpkin guts because she thought it was funny. Ah, four-year-olds. Such refined senses of humor they have. 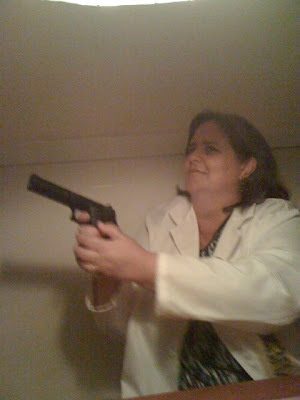 By yesterday, she'd retrained her malleable brain and was huffing pumpkin fumes with an "Ooh, the smell of Halloween!" Thanks for the pictures, Sophie, and kudos to the kids on such creative JOLs. 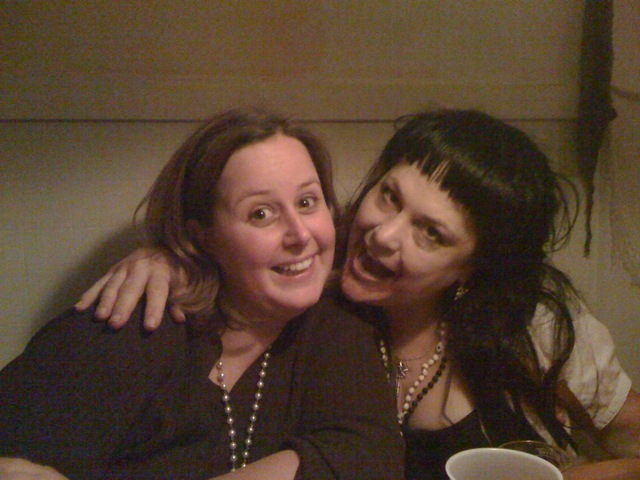 Love that Hellraiser. 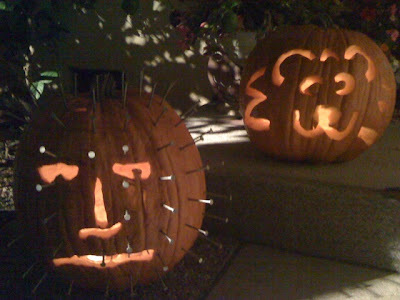 Pinhead jack o lantern, very cool! These are the best pictures. I'm wildly jealous I'm not in them. Next year!! Is that Jace as a Blond? What happen to the red?